Yes good old Injuries, at some point we have all had an injuries. Whether it’s a muscle, lower back, upper back, hip, knee or any other part of the body I have missed. Injuries can happen at anytime or place. When training the most common injuries are sport injuries. And the list can go on. The top four would be the one I see a lot with clients, when client are training by themselves. These injuries are mostly over use injuries, direct impact or application of force that is great than the body can structurally withstand. There are two kinds of sport injuries: acute and chronic. 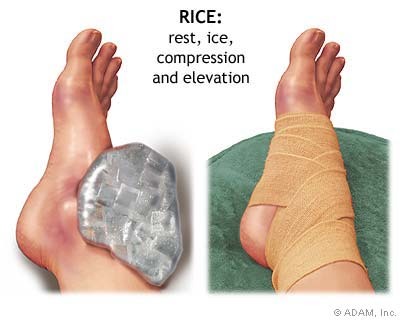 So what is acute injury, it’s an injury that occurs suddenly, such as a sprained ankle caused by an awkward landing. So what a chronic injury: it’s an injury caused by repeated overuse of a muscle group or joints. Poor technique and structural abnormalities can also contribute to the development of chronic injuries. So what do if you have an injury? First Aid, I can’t say this enough, don’t try and run it out, or stretch it or get or friend to pull your legs! (Yes I have tried them and they don’t work!). •	Compression: – Apply a firm elastic bandage over the area. •	Elevation: – Raise the injured are above the level of the heart. •	Referral: Yes go see someone! As soon as possible, see a qualified healthcare professional. They are the guys who will help you get back on track quicker. Injuries are not the end of the earth, yes they hurt and feel than it’s never going to end. But if you are injured have the feeling the something is going on go see a Qualified Healthcare Professional. I can’t say this to my clients enough, if it hurts not use it. Also if you let the injury untreated it can have far more severe consequences! So look after yourself and get heathy!